So I just wanted to wish everyone a very Happy Holiday season!! 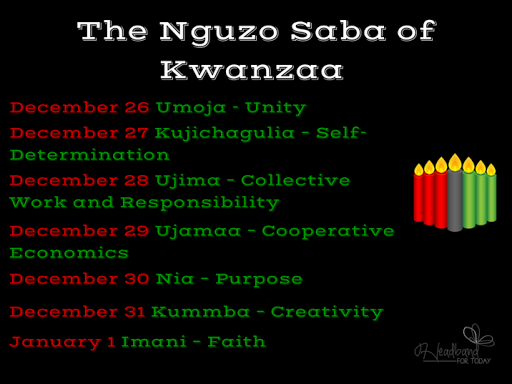 And you know me I live for this time of year mostly for Kwanzaa lol. I love the others too. But Kwanzaa means a lot to me. Anyway this year I wanted to be more specific and make this another personal Kwanzaa. Because there's still a lot of things I want to change or at least promote change in my life and hopefully make a better future. We all have things or even resolutions if you will that we want to implement into our lives to have a better tomorrow, a better year and even a new and improved self as well! It shouldn't be a once a year thing. It should be all the time! There's always room for improvement and that's what I'm aiming to do. Especially since I'll be heading into my 30s this upcoming year too. So let's get the celebration on! !